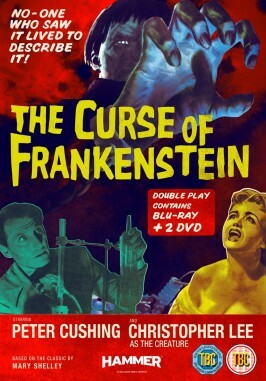 Hammer, Icon Film Distribution and Lionsgate are proud to present Terence Fisher’s Gothic classic The Curse of Frankenstein fully restored in High Definition and for the first time in its original Academy ratio of 1.37:1. Available 15th October in the UK & Ireland on 3-disc Double Play, the pack includes 1 x Blu-ray and 2 x DVD packed full of brand new content. Featuring new documentaries and bonus extras, and including the infamous “eyeball” scene, which was originally banned but has now been fully restored. Amicus Productions–the infamous Hammer rival and nicknamed the “studio that dripped blood”–churned out a raft of above-average horror films during the sixties and seventies, hitting their stride with DOCTOR TERROR’S HOUSE OF HORRORS. An enormously entertaining portmanteau film, DOCTOR TERROR’S HOUSE OF HORRORS would serve as a blueprint to what would become a successful formula for Amicus, with many other anthology films following in the decade to come. Though synonymous with the portmanteau film, Amicus were also responsible for making many a conventional horror film and it must be said, most are lacking the punch of their anthology counterparts, and this is certainly the case with Freddie Francis’ 1965 effort, THE SKULL, which has just been released on Region 1 DVD by Legend Films. THE SKULL—based on the novel by PSYCHO author Robert Bloch—concerns one Christopher Maitland, collector of all things sinister and macabre who, through an unscrupulous dealer, is offered the skull of the Marquis de Sade. Though declining a potential purchase, Maitland becomes obsessed with infamous Frenchman’s former brain vessel and it’s not long before he is becoming consumed by it, despite being warned by its previous owner, Sir Matthew Phillips (Christopher Lee). Phillips had been overcome by the skull’s otherworldly power but managed to escape its hold after realising evil spirits were harnessing its energy on the first two nights of each new moon. But is it too late for Maitland? Will he manage to resist the heinous artefact once and for all, or will he—like many others before him—succumb to it completely? So begins THE SKULL, which starts promisingly enough but is soon diluted into a whole that is ultimately unsatisfying. Watching the film, one cannot help but think the film would have worked so much better as a component of one of Amicus’ anthology films, rather than a full length feature. Even though it clocks in at a brisk 83 minutes, the film feels very protracted and padded, with the writers merely going through the motions to sustain a feature running time. If you can overcome any initial disappointment—and let’s face it, some of Amicus’ other forays into horror are a high benchmark for comparison—there’s still plenty to enjoy and admire. Cushing is wonderful and Christopher Lee adds plenty of prestige to a role that is little more than a cameo. Though Francis’ direction is a little more languid than it is at best—and again this adds yet more weight to my argument—he certainly gets the most out of his cinematographer, John Wilcox, who manages to achieve some truly remarkable and visually arresting compositions. The interior of Maitland’s home, particularly his mauve hallway, and a set-piece involving a death and some stained glass serves as a glimpse to the future world of Dario Argento’s SUSPIRIA, a film that would be made some eleven years later. Legend Films has done a stellar job of creating a pleasing transfer for THE SKULL’s worldwide premiere outing on DVD. The film is framed in anamorphic widescreen, preserving the original 2.35:1 Techniscope ratio. The image is very solid, though there is some grain evident in darker scenes. The films mono soundtrack is also solid and the package comes complete with the film’s original theatrical trailer. Gripes aside, THE SKULL is a pleasing enough addition to the British horror canon but should be judged on its own merits, rather being compared to the genre’s best. This is the first of the discs from a catalogue of titles Legend Films has licenced from Paramount Pictures and it must be said that its presentation bodes well for the rest of them. 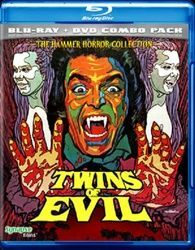 Synapse films will unleash classic Hammer horror TWINS OF EVIL in the US as a Blu-ray + DVD combo pack on 10th July. Made in 1971 and directed by John Hough (THE LEGEND OF HELL HOUSE, THE WATCHER IN THE WOODS), former Playmates Madeleine and Mary Collinson star as the titular wrong-doers who are pitted against their righteous uncle Gustav (Peter Cushing) in this minor classic of British horror cinema. THE FLESH AND THE FURY: X-POSING TWINS OF EVIL (84 mins.) – An all-new, feature-length documentary exploring Hammer’s infamous ‘Karnstein’ trilogy from the origin of Carmilla, to the making of TWINS OF EVIL! Featuring exclusive interviews with director John Hough, star Damien Thomas, ­cult film director Joe Dante, Video Watchdog editor Tim Lucas, and more! In 1906, British anthropologist Sir Alexander Saxton (Christopher Lee, HORROR OF DRACULA) discovers the frozen remains of a primitive man that he believes to be the missing evolutionary link. He crates it up and to take it back to England with him aboard the Tran Siberian Express. When a thief (Hiroshi Kitatawa) who tried to open the crate turns up dead with white eyes, Pujardov (Alberto De Mendoza, A LIZARD IN A WOMAN’S SKIN) – the confessor of fellow train passengers Count Petrovski (George Rigaud, MURDER MANSION) and his considerably younger wife Irina (Silvia Tortosa, THE LORELEY’S GRASP) – believes the contents of the crate to be something demonic. Curiosity gets the better of Saxton’s compatriot – and compartment-mate – Dr. Wells (Peter Cushing, THE CURSE OF FRANKENSTEIN) and he pays the baggage man (Victor Israel, THE WITCHES MOUNTAIN) to take a peak into the crate. When the baggage man disappears, Inspector Mirov (Julio Pena, CHIMES AT MIDNIGHT) orders the crate opened, only to discover the baggage man’s white-eyed corpse and no sign of the ice man. An autopsy of the baggage man reveals that his brain is completely smooth, as if it had been erased. The next victim is Natasha (Helga Line, HORROR RISES FROM THE TOMB), a spy who had boarded the train to break into the baggage compartment’s safe to obtain a jewelry bag belonging to the Petrovskis. Mirov shoots and kills the creature, and Wells’ examination of the fluid from the creature’s eye reveals not only pictures of dinosaurs but also the Earth as seen from space, proving that the creature was an alien life form that absorbed the thoughts of its victims (and Saxton wonders how such a creature could ever die). The jewelry bag turns out to contain a piece of steel and Petrovski reveals that spies are after the formula, which is only contained in the Count’s mind. Pujardov believes the beast is not dead, and he is soon proven right when more victims turn up. As the train passes through Siberia, a communiqué from the conductor (who promptly disappears) brings ruthless Captain Kazan (Telly Savalas, LISA AND THE DEVIL) and his soldiers onto the train to take over the investigation, but the creature – now inhabiting one of the passengers – has more brains on its hit list. Although usually classified as a Spanish/UK co-production, the film was produced by blacklisted Hollywood writer Bernard Gordon, who was collaborating at the time with producer Philip Yordan (who fronted a number of Gordon’s Hollywood credits) and Samuel Bronston. The script was by blacklisted American screenwriters Arnaud D’Usseau (LADY SCARFACE) – the Los Angeles, California-born son of serial writer Leon D’Usseau and TV actress Ottola Nesmith – and Julian Halevy (CRACK IN THE WORLD), who had also scripted the Bernard Gordon-produced British supernatural biker film PSYCHOMANIA, and shot on the leftover train sets from PANCHO VILLA, Gordon’s previous production with Savalas, writer Halevy, director Eugenio Martin (A CANDLE FOR THE DEVIL), composer John Cacavas (who wrote the theme song sung by Savalas; the score was written by BLIND DEAD series composer Anton Garcia Abril), and HORROR EXPRESS cinematographer Alejandro Ulloa (NIGHT OF THE WEREWOLF). Yordan shared screenplay credit with Martin on his western BAD MAN’S RIVER (although Yordan’s authorship of many of his credited works has been in question for some time), but HORROR EXPRESS was apparently conceived and produced while Yordan was abroad promoting PANCHO VILLA (although Yordan apparently held the rights to HORROR EXPRESS when it was released on DVD at the dawn of the format by Simitar in an unsatisfactory but apparently copyrighted transfer). There is a comic strain running through the film that is not normally encountered in Spanish horror. Lee and Cushing balk at the suggestion that one of them could be inhabited by the monster (“We’re British”) and when Wells asks his American colleague Miss Jones (Alice Reinhart, RAT FINK) for assistance, she takes in Wells’ comely dining companion Natasha and says “Well, at your age, I’m not surprised,” before he clarifies that he needs her to help with an autopsy, “Oh, well that’s different.” Irina also threatens to send the already-exiled Captain Kazan to Siberia. As most fans of the film and the Lee/Cushing pairing know, Cushing’s wife died right before the filming was to commence and he no longer wanted to do the film. Lee reportedly was the once who convinced Cushing to press on, and the film is one of the few collaborations where they are on the same side and get to gently spar off one another (there is also something very warm about the tight closing three-shot of Lee, Tortosa, and Cushing at the edge of the precipice regarding the burning remains of the train). As Wells’ comic foil, Reinhart’s Miss Jones is genuinely missed when the creature does away with her, as it would have been interesting to see her engaging in the discussion of the monster’s abilities. Savalas gives a showy performance that is more than a cameo, but at times seems made up on the spot (director Eugenio Martin contrasted the comic styles of Lee and Cushing with Savalas, and described Savalas’ approach as more improvisatory from take to take). Tortosa’s countess is the damsel in distress, but more than a pretty face with her character’s wicked sense of humor and attempts to engage with Saxton that skirt the lines of proper behavior for a married aristocrat. Spanish genre fans will also get a kick out of seeing Alberto De Mendoza in a supporting role with some real meat to it (De Mendoza – possibly dubbing himself – deservedly receives third billing below Lee and Cushing in Spanish prints). Besides Spanish horror regulars Rigaud, Line and Israel, Barta Barri (WEREWOLF SHADOW) also turns up as a telegraph officer. Bit player Faith Clift had previously appeared in the Yordan-scripted Spanish western CAPTAIN APACHE and later turned up in the Yordan-scripted horror abomination CATACLYSM, footage of which was reworked into Yordan’s anthology film NIGHT TRAIN TO TERROR (which also featured footage from DEATH WISH CLUB and the unfinished SCREAM YOUR HEAD OFF). The cinematography of Alejandro Ulloa (THE NIGHT OF THE WEREWOLF) is made up of handsomely lit studio train interiors and some somewhat reckless handheld exterior shots (possibly second unit). John Cacavas’ score (his first after penning the theme song for PANCHO VILLA, the actual score of which was composed by co-production quota talent Anton Garcia Abril [TOMBS OF THE BLIND DEAD]) is one of the most enduring elements of the film with its whistled main theme (also played on the piano by Irina) and the orchestrations built upon it, as well as electronic bits that accompany the red eye scenes, and the tragic fugue that underscores the climax. Released on multiple PD VHS labels (as well as legitimately by Media Home Entertainment, and then later Prism Entertainment with a memorable clamshell cover) and then on multiple PD label DVDs, HORROR EXPRESS got its first decent release through Image Entertainment as part of their Euroshock collection. Although interlaced, the 1.66:1 non-anamorphic widescreen transfer was a major improvement and also featured the Spanish mono dub and an isolated music and effects track (which featured some nonsensical alternate music in the scene where Irina plays the piano and hears the creature whistling). A very good fullscreen release (judging by screencaps) followed a couple years later in the UK from Cinema Club, and then another non-anamorphic widescreen release followed from Germany (this release first featured the opening shot that had been blacked out on most English language prints). HORROR EXPRESS is the most impressive HD remaster of Severin’s reissues of horror films originally released by Image – at the time, licensed from the Dutch company TV Matters – thus far (HOUSE OF THE SEVEN CORPSES is another upcoming title). Whereas PSYCHOMANIA featured a problematic master full of combing, poor detail, and switching aspect ratios, CRUCIBLE OF TERROR was at the mercy of its rare 35mm print source, and THE BABY’s matting was a little severe vertically and its black levels sometimes milky, HORROR EXPRESS features great black levels, fine detail, and great saturation of the striking blues and eye-popping reds that stand out amidst the burnished browns of the sets and the period checkered and herringbone wardrobe (themselves free of the rainbow moiré patterns evident on the Image Euroshock transfer and the various PD DVDs). The print source utilized is the Spanish version of the film which restores the opening shot of the train rushing by the camera (the sound of the train is heard over black on the US prints, including the Granada production credit), which is the Spanish PÁNICO EN EL TRANSIBERIANO card (note that both the English and Spanish credits misspell Lee’s first name as “Cristopher”). Also restored to the end of the film is the scrolling cast list in place of the extended black screen that accompanied the music for quite a time after the FIN card. The English mono and Spanish mono tracks are in good condition, although Severin has not included English subtitles for the Spanish track. This is the first Severin DVD + Blu-Ray combo pack and the Blu-Ray sports a 1080P AVC-encoded transfer. Some speckling during the opening credits is more apparent in the HD version, but A/V enthusiasts are more likely to be disappointed by the lossy Dolby Digital audio tracks (encoded at the same 192 kpbs bit-rate as the DVD edition, although the Severin Blu menu insists that the Spanish track is stereo while the DVD identifies it as mono), although these options should not hinder ones enjoyment of the film. Severin has dropped the music and effects track, but have provided a wealth of new extras, starting with an alternate audio track which features an eighty-minute 1973 interview with Peter Cushing. The interview covers everything from Cushing’s admiration of Tom Mix (he wanted to be a cowboy before he wanted to be an actor), looking for theatrical work while working a desk job, breaking into movies, and eventually to his Hammer and Amicus work. It is a warm and humorous discussion with some questions and answers later in its length (when asked about films that have scared him, he cites the recent THE POSEIDON ADVENTURE, which did not so much frighten him as had him gripping his seat). The interview has been subjected to digital clean-up and the voices are always audible and clear, but there is an occasional loud clicking sound. As with Severin’s DVD of PSYCHOMANIA, Fangoria editor Chris Alexander provides a brief but infectiously enthusiastic introduction to the film, which delves back into the dawn of video and his discovery of the title before providing some background on the film itself (including Alexander’s observations of how Lee’s concern over his recently widowed friend Cushing translated itself to the screen in this film). Director Eugenio Martin provides a pleasant English-language interview in which he creates a vivid picture of the energetic atmosphere of the production from scripting to shooting (here’s hoping that some enterprising company picks up A CANDLE FOR THE DEVIL and gets his input). He is very specific in his recollections of Lee, Cushing, and Savalas (one wishes that he had been prompted about some of the Spanish cast members). When speaking about the special effects, he recalls how he, Cushing, and Lee played with the electronically-controlled model train, and how the zombie actors’ difficulty of working with the blank contact lenses. The late producer Bernard Gordon is featured in a half-hour interview. HORROR EXPRESS is never mentioned at all (other than in a text screen of Gordon’s credits added by Severin) because the interview was shot back in 2005 to be included in a planned box set of Samuel Bronston’s films (the project was eventually shelved). As such, Gordon – who had been involved in unionizing screenwriters – speaks about being blacklisted in Hollywood for refusing to name names before the House Un-American Activities Committee (in 1999, Gordon lead the protest against the honorary Academy Award that was presented to director Elia Kazan, who had named names), his first few credits, and his collaboration with Bronston and producer Philip Yordan, who fronted several of his writing credits (and whose several other writing credits have come into question). Gordon is frank about Yordan as a producer, and the egos of several of the stars and directors he worked with. He respected director Frank Capra, but called his script for the Bronston-produced John Wayne film CIRCUS WORLD incomprehensible (Capra was fired and it was eventually directed by Henry Hathaway from a script by Halevy, Ben Hecht, and James Edward Grant from a story by Yordan and Nicholas Ray). Gordon also is candid about Charlton Heston’s jerky behavior towards Ava Gardner that caused her to leave the production early (and Gordon’s workaround for her early departure). Composer John Cacavas appears in a brief interview called “Telly and Me” that discusses his career in the context of his friendship and working partnership with Savalas. Cacavas’ first scoring assignment was the theme song for PANCHO VILLA which was sung by Savalas (co-production requirements disallowed him from scoring the rest of the film), followed by HORROR EXPRESS. Cacavas went to Spain to score the picture while it was in the editing phase and spent most of his fee on a small orchestra (without a violin section) for the project. He briefly mentions scoring THE SATANIC RITES OF DRACULA (and does not mention other prominent scoring assignments like AIRPORT 1975, AIRPORT 77, and the memorable TV horror movies NO PLACE TO HIDE and CRY FOR THE STRANGERS) before moving onto his further Savalas assignments like the entire series run of KOJAK. An Easter Egg features a minute-long visit to the train station location (now a museum) and is scored with a stereo version of Cacavas’ main theme – probably from the Citadel CD soundtrack, which paired the score with Les Baxter’s rescoring of CRY OF THE BANSHEE – that is so rich, it makes one wish for a surround remix of the film’s soundtrack. The film’s rare 35mm theatrical trailer (which made its debut on a couple of Severin’s recent horror titles) and trailers for PSYCHOMANIA, THE HOUSE THAT DRIPPED BLOOD (another forthcoming release), and NIGHTMARE CASTLE round out the extras. With their first Blu-ray+DVD combo release (I hope this will be a trend for Severin), Severin have finally done the PD/VHS standard HORROR EXPRESS justice in a time where other labels are not so willing to take on titles that have had prior releases (even if they have the opportunity to do them right). The delays from the original street date (rumours of an unacceptable HD master) have proven to be worth the wait with an exquisite looking transfer – viewers who know this film from TV and the dawn of video tape will appreciate this – and extras that convey affection for the film from the makers and its fans (rather than some of the “Look how terrible this old film is” ones that grace other exploitation films of this era). Here’s hoping that Severin tackles some more guilty pleasures of video yesteryear in addition to expanding their diverse catalogue of the art films and slick and sinful erotica.